There are a lot of great musicians in Richmond, VA. Of late the most interesting combination for me is the Tin Can Fish Band. I was more than happy to have in the studios Steve Fisher and Doug Austin (mandolin/fiddle). Both are alumni of the Croude Bande and great guys. Hyperbole is rampant in the music biz. No profound statement there. So what I do say as a fan of their music is face value for me. New York, a generation ago, gifted us with The Band. 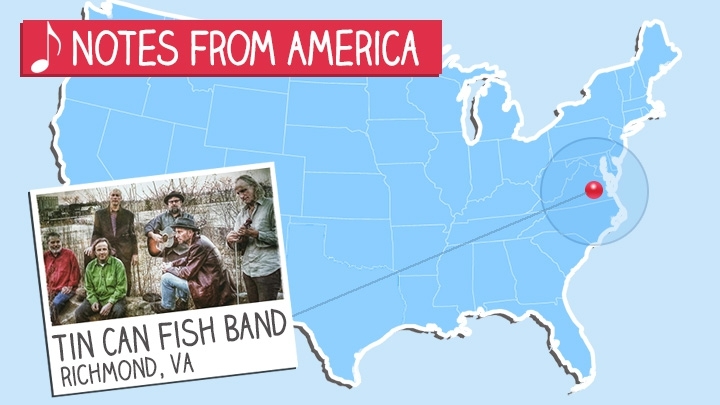 In our own time and space Tin Can Fish Band is the Virginia equivalent. Not just in vibe, but great original songs with the same kind of gusto that Robbie Robertson gave us--and he was Canadian. Here we have songs about America, primarily written by Steve Fisher. Doug Austin’s mandolin and fiddle are always distinctive as are the sound colours from accordion/bass/guitar/and drums that round out the group’s flavorful stylings. Listen to Tin Can Fish Band: Part B here. The Electric Croude airs every Saturday night on 88.9 WCVE at 10:00 p.m. EDT while simul-streaming at ideastations.org. Follow the host with musical promotions and anecdotes on Facebook at Geo Maida.